The tool is called npm-windows-upgrade and can be found on GitHub. The tool simplifies the numerous steps previously required on Windows and is now the recommended approach by the NPM team. In the end I ran this tool several times to test out various versions and it worked well, upgrading NPM in place successfully. Something that’s proving popular on Medium these days are “development roadmaps” that outline a roadmap approach to choosing techniques and technologies for certain technical domains (for example Web development or Dev Ops). Some of these are particularly powerful for putting the many bewildering technologies all on one page with logical grouping and a visual representation of how they interact. Modern web development has seen so much change over recent times that it is very easy to get lost and become overwhelmed and these roadmaps can help clear the fog (a little). My favourite is the Web Developer Roadmap in 2019 maintained by Kamran Ahmed over on GitHub. I have shared this with several people who have also found it useful regardless of their level of expertise. The front end roadmap is a great guide to what the community are currently settling on as the standard choices for tooling and techniques. I have checked back to the roadmap a few times over the last 6 months to verify my approach when starting on a new project and I find that visualising the options makes decision making easier. There are also Backend and DevOps Roadmaps included which are equally as useful. For some more useful roadmaps check out this medium post. Recently whilst building Jenkins CI pipeline, with SonarQube static analysis, the JUnit unit test results were not being included in the Sonar dashboard results. The Jacoco based test coverage results were being included fine but not the actual test pass/fail percentage. 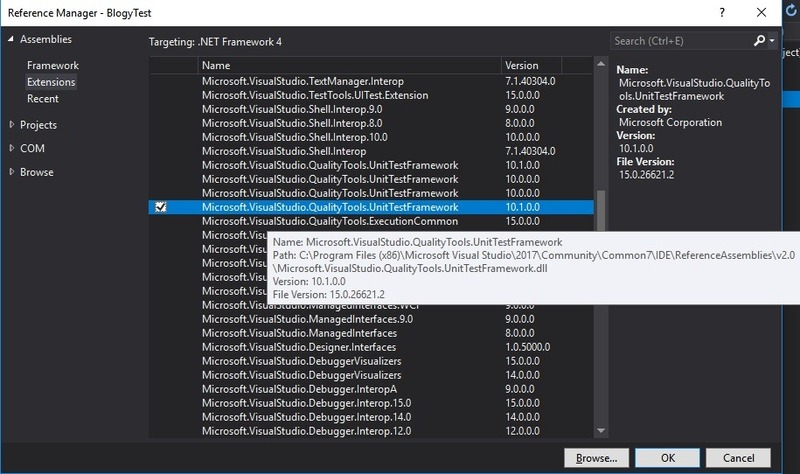 This post outlines the steps to create a new unit test project in Visual Studio 2017 using MS Test V1 and that targets .Net Frameworks prior to .Net 4.5. Visual Studio 2017 onwards only has new unit test projects for MS Test V2 onwards and .Net 4.5. This is fine for new applications or ones targeting a recent .Net framework version but what if you have an existing solution targeting an older .Net version. 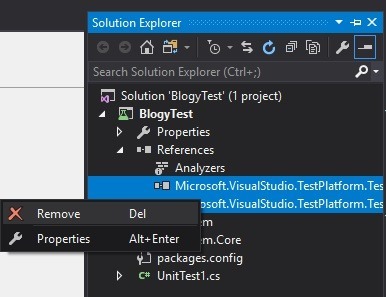 Below shows the Unit Test Project available for .Net 4.5, but as you can see in the second screenshot for .Net 3.5 its not available. Create a new MS Test V2 project targetting .Net Framework 4.5 as in the first screenshot above (i.e. File > New Project > Test > Unit Test Project targeting .Net 4.5). 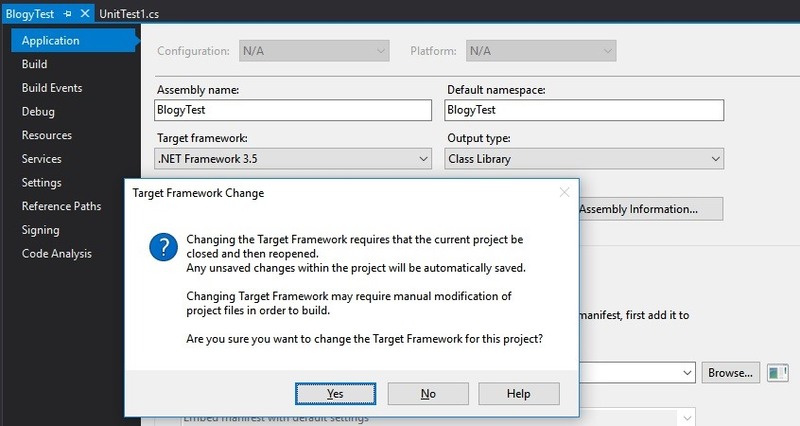 Once its created, change the project to target your earlier .Net Framework (e.g. .Net 3.5). This is done via the Project Properties page. Click Yes and Visual Studio will reload the project. Once it reloads the project will complain about some references which is fine as we’re now going to remove the MS Test V2 assemblies. Now remove the two project references to test assemblies. If you are not running Visual Studio Enterprise, then swap Enterprise in the path for Community etc. Now rebuild the project and you’re all done. Or you may have issues whereby the wrong code version appears to be loading at run time or perhaps when debugging you get an error saying a referenced component cannot be located. All these issues stem from you not being able to view what components are actually being loaded during debug. If only there was a view in Visual Studio that gave you that info…well this is Visual Studio and so they’ve already thought of that, and its called the Modules view. From this really useful view you can see each component that’s been loaded, the file path, the symbol file location, version information and more. This will show you if a component from the GAC has been loaded instead of your local file version, for example. It also enables you to find and load Symbol files for components where they have not been loaded automatically. For information on the full functionality of this view check out the documentation here. I rece ntly upgraded a SonarQube server installation from v5.6.2 to v6, and unfortunately hit a few issues along the way which I thought I’d share here in case others experiences the same issues. All were resolved in the end and if you are yet to be running SonarQube to analyse your software assets please don’t be put off my these small issues. SonarQube is an outstanding tool to have in your Quality Control armoury and it is really incredibly easy to set and run. In fact you can download it and run it straightaway in under two minutes without installing anything (check out this link Get Started in Two Minutes to learn how). After verifying the database was indeed up, running, not blocked by a firewall and indeed open on the specified port I found that I had to turn off dynamic ports on my Sonar DB server. 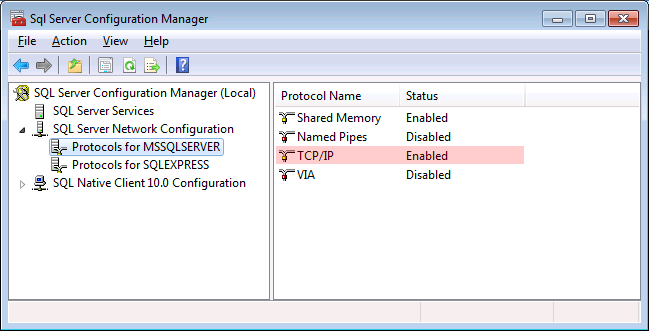 To do this open the SQL Server Configuration Manager application, under SQL Server Network Configuration – Protocols for Sonar, right click TCIP/IP and choose properties. Under IP Addresses ensure that TCP Port is 1433 for all entries (including IPAll) AND ensure that TCP Dynamic Ports is blank. My TCP Dynamic Ports value was “0” which actually enables dynamic ports! After this change DB connectivity was successful. Cannot resolve the collation conflict between “Latin1_General_CI_AS” and “Latin1_General_CS_AS” in the equal to operation. After some googling I hit this very useful Stack Overflow post where the problem is explained. I choose to manually update the database collation (option 3). After running the suggested query I was able to work out the indexes that needed to be dropped and recreated to enable the collation to be updated. After this I deleted the data out of the SonarQube temp folder (ensuring that the Sonar Service had been stopped) and restarted the service and this triggered the upgrade process again which this time completed successfully.